Welcome this first and most comprehensive guide to Tibet’s ancient integrative healing system-one of the world’s oldest forms. 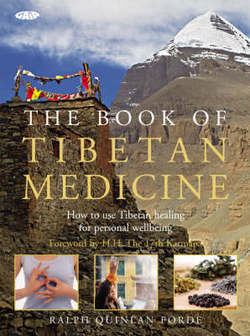 The Book of Tibetan Medicine provides a thorough overview of the origins and practices of this holistic approach and explains how it can contribute to maintaining overall health and happiness. You will learn how to balance body, mind, and spirit through diet, behavior, yoga, herbalism, acupuncture, Buddhist relaxation techniques, and medicines derived from natural sources. By taking an especially in-depth look at contemporary ailments-including stress and allergies-this highly accessible and lushly illustrated manual brings Tibet’s age-old and traditional discipline into the here and now, with invaluable advice on how to use it to improve your well-being. Professor Jan de Vries, a name that has been synonymous with expert complementary healthcare for over 40 years has recently stated the following about The Book of Tibetan Medicine,"This is possibly the best book I have read for a long, long time. For thousands of years Tibetan Healing has been known all over the world. The writer has used his knowledge of Tibetan medicine in a very constructive way. He has the great gift of putting together how Tibetan medicine can be applied in our day and age.' Jan de Vries is the author of over 30 books on complimentary medicine. This beautifully illustrated book is for anyone interested in holistic healing and looking for an alternative to modern medicine. Author Ralph Quinlan Forde shines the ancient art of Tibetan healing in a contemporary light. "This is a most excellent book, extremely informative on an important and esoteric field of knowledge. The four medical tantras of Tibetan Medicine contain profound secrets of healing, especially for the mind. I hope The Book of Tibetan Medicine will begin a dialogue world-wide, especially in psychiatric medical circles, on the nature of mind and consciousness, and how they should be understood and treated, with the aim of increasing health, compassion and well-being." Let this informative, enlightening and enriching book be the vital force in your life, as it brings together body, soul and mind in an effortless and compassionate way. This is one of the most refreshing books I have come across for a long time. Wrote to make a scientific case for this ancient medical system, practicised for over 1000 years. health and wellbeing as it's possible to be!